Senator Schatz grew up in Hawai‘i where he developed a true passion and reverence for the ocean. Upon taking office in 2012, he made protecting the ocean one of his top priorities. In June 2016, he sent a proposal to President Barak Obama to expand Papahānaumokuākea Marine National Monument ten years after President George W. Bush signed the executive order establishing its original boundaries. That expansion made it the largest permanent conservation area in the world. 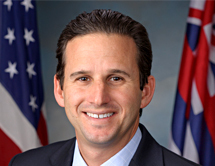 Senator Schatz is an active member of two Senate committees with primary jurisdiction over the oceans. As a member of the Senate Commerce Committee, he has helped develop and pass legislation to address toxic algae and dead zones, pirate fishing, coral reef conservation and seafood fraud. On the Senate Appropriations Committee, he has fought to ensure funding for important initiatives to study, protect, and restore the ocean, coasts and communities that depend on them.